Go Conquer is now favourite for Saturday's £100,000 Sodexo Gold Cup at Ascot, as Nigel Twiston-Davies' charge bids to win the Grade 3 handicap chase for the second time. The subject of strong support in the Sodexo Gold Cup betting this week, Go Conquer is now no bigger than 11/2to win the Ascot chase with Black Type, heading the market, despite being rated 5lbs higher than he was 12 months ago. Can he do the double? Can he win for his new trainer, Having being saddled by Jonjo O'Neill in 2017? We think not, and we've found two big prices to take him on. Go Conquer (11/2 Black Type) took this race last year and, while he has failed to win in three subsequent starts, he acquitted himself well on the last two of those, having attempted to make all, made jumping errors, and unseated his rider over this course and distance last December. That was the nine-year-old's second blip at Ascot. He's run at the London course five times, falling, unseating, winning, and finishing second twice, though all these runs were for trainer Jonjo O'Neill. The son of Arcadio has since joined trainer Nigel Twiston-Davies, a yard who traditionally do well in the early part of the season, giving him strong claims of recording back-to-back Sodexo Gold Cup wins. Too Many Diamonds looks the pick of the Dan Skelton-trained entries, with Virgilio instead heading to the Charlie Hall Chase at Wetherby. Too Many Diamonds arrives at Ascot fresh, having last run at Southwell in August, finishing second in a 2m4.5f handicap chase to Voix D'Eau. The seven-year-old had made a rapid ascent of the chasing ranks in the spring, with his five chase runs resulting in a 33lb hike in the weights - courtesy of three successive wins at Southwell. A sound surface suits and a bold show looks likely at 16/1 (Paddy Power). Chasing his own hat-trick here is the six-year-old Thomas Patrick, who’s most recent victory came in a soft-ground Grade 3 handicap chase at Aintree in April. That effort came over 3m1f, and connections will be hoping that rain arrives, given he was a non-runner at Chepstow three weeks ago, owing to the good ground. While Thomas Patrick (8/1 Coral) has a progressive profile and remains one of the more interesting runners the Sodexo Gold Cup betting, it is probably best looking elsewhere for the winner given his apparent preference for softer surfaces. Traffic Fluide comes into this race off the back of a good second in a handicap chase over 2m7.5f at Chepstow (good) last month. Trained by the 2016 winner, Gary Moore, the nine-year-old ended last season on a high with a Grade 2 handicap win over 2m5f at Cheltenham. Another who is unexposed in handicaps, having done most of his racing at open Grade 1 and Grade 2 level, that Cheltenham success was just his third handicap start since winning over 2m at Sandown (good) in March 2015. Kings Lad has undergone a wind operation since victory in a four-runner 3m2f handicap chase at Fontwell (good) in May. He returned with second at Newton Abbot (good) and has since won at Chepstow (good-to-soft) over 2m7f. Trained by Colin Tizzard, the son of King’s Theatre has to defy a career-high mark of 138 in the Sodexo Gold Cup, but with the runner-up at Chepstow winning at Aintree last Sunday, he looks worth an each-way bet at 10/1 (Paddy Power). Best Sodexo Gold Cup Bet? 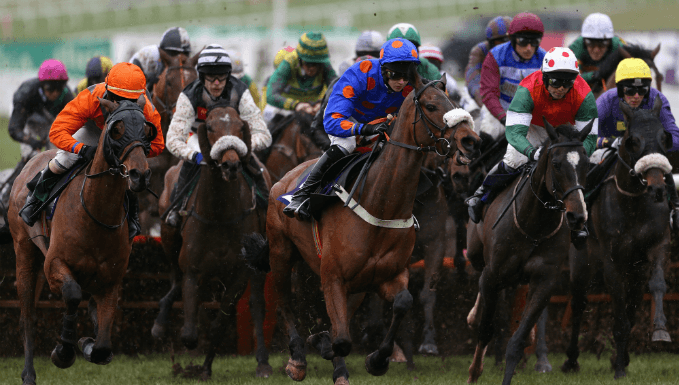 At the prices, with the ground unlikely to change too much, Kings Lad (10/1 Paddy Power) and Too Many Diamonds (16/1 Paddy Power) look like the best bets in the Sodexo Gold Cup at Ascot this Saturday. They both look like they have improvement to come, and that could expose their handicaps as lenient.